I need some help. I needed some new springs as mine had flattened out over the last 9 years and I ordered the EX Flex to upgrade the equalizer as well. 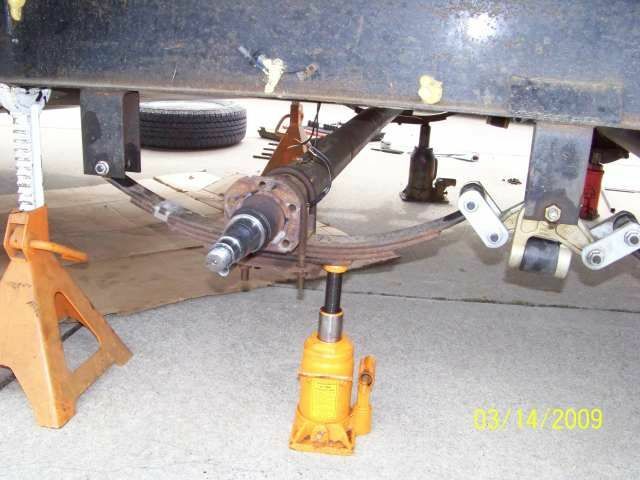 I have 5200lb Alko Axles with 4 leaf springs. My spring hanger spacing is 29.5". My Alko Equalizer measures 6.25" from center to center and my old springs were 26". I ordered the smaller EZ Flex and 6K 26" leaf springs from Etrailer. The new springs came with 6 leaves. OK, here is my problem. When I installed the first side, instead of the EX-Flex looking like a W in looks more like an inverted M. The shackles are vertical almost. I am worried that I may not have room for flex during bumps, etc. I called Dexter and they are not sure what is the problem. They confirmed that 26" springs are the correct springs for 29.5" hanger spacing. My old side with OEM equipment does not look like a W either though. I do not have a picture though. Any help is appreciated and thank you in advance. Sure looks like the springs are too long by maybe an inch each. Is the picture with the weight on the wheels? The next size down would be 25.25" springs and that to me that would move the top shackles out another 1.5". 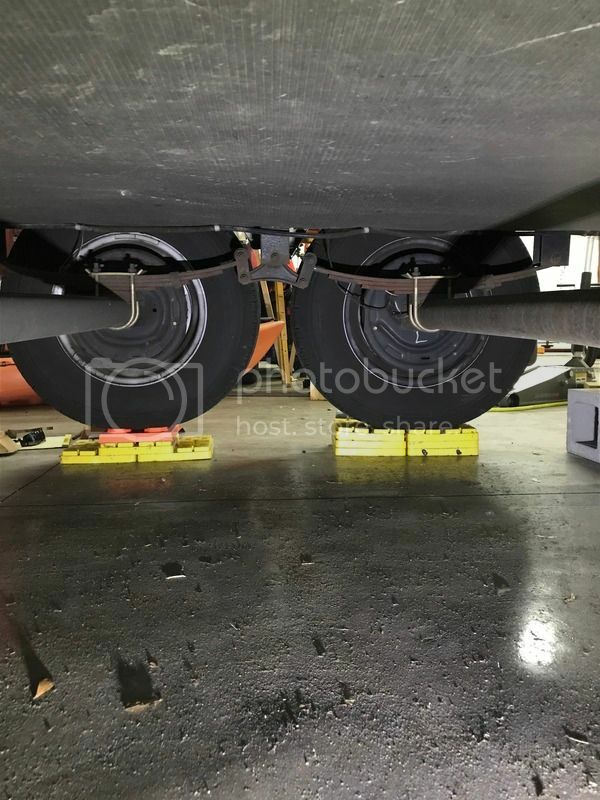 In the top picture, the weight is on the new side with wheels down. The other old side is jacked up about 3 plastic blocks worth as I was getting ready to do that side. But then I got to looking at it and thinking that maybe something is wrong. Does the spring pack sit on top of the axle tube or below the axle tube? Hanger distance. One of these hangers is all messed up. Take a few pics of the old setup looking on the inside of the tires from the opposite side and then the new side and post. These pics will look like the last 2 pics in my post above. We cannot see the entire setup. Looking from the back side we can see everything as there is no tire covering everything up. 4.25" on the online drawing from etrailer but I will double check tonight and make sure). Great suggestion on the picture from the other side. I will take some more tonight and report back. Thank you in advance! I did some digging on this. Thanks for the info, that helped. A few things do not add up. You have 5,200# axle tubes, but you are replacing the springs with 3,000# per spring pack = 6,000#. Your axle or your tires are going to be weaker then the springs. What where your thoughts on going to 6,000# of spring? That is 12,000# of camper spring set where before you had 10,000 or 10,400#. Having you weighed the camper? Next is the 26" centers on the 6,000# springs. 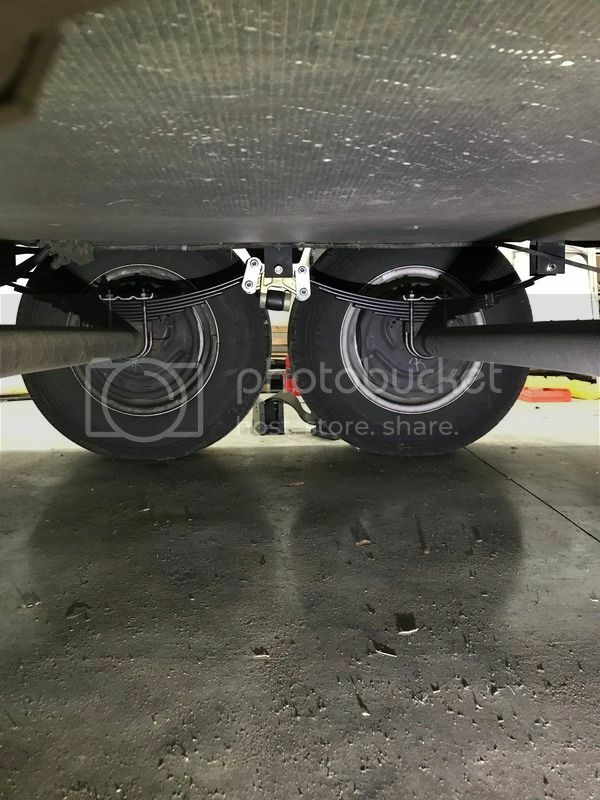 Here is a fast check, you said 33" axle spacing which I asked for, but in this case, what is the end spring hangers center to center? See this pic, Mine says 54 71/6" on the right side, what is yours? We really need this number to help sort this out. Note: I have 32" axle centers. Not your 33" which is more standard. The small Dexter EZ flex EZ flex instructions on page 5 says the lower center to center of the eyes is ref 5.7" This will change when you are loaded but it is a place to start. 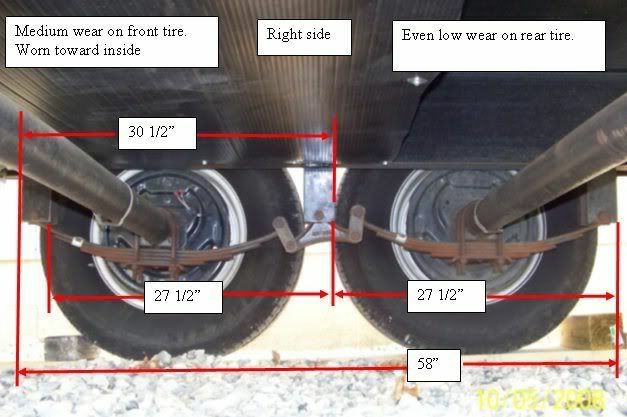 This pic shows the spring eyes on a "loaded" axle as being very close to each other. By that picture, the spring eyes are even less then the EZ flex which starts at 5.7" and compresses. And your 26" on the spring eyes is a relaxed distance. When the spring is loaded it gets longer as the spring starts to flatten. OK, at this point we need that hanger to hanger spring center distance. Before you change any parts out, ideally we can sort out the math on how the old springs and the much longer Alko rigid equalizer worked. At this point, I suspect your original springs are not on 26" centers. Better picture of the old side: My old springs seem to be 26". I measured the distance from the top of the old spring to the center line of the eyes and it was about 2 7/8". They are only 25 1/8" long though. I am worried that they might lower my trailer. They are 4 leaf and 6k rated and the distance from the top of the spring to the center line of the eyes is 3". The reason I went with the new 6K springs was to add some capacity as my old springs flattened over time. I did not realize the difference in the height from the top of the spring to the center line. My hanging spacing is 29.5 from center of the forward hanger to the center hanger. It is also 29.5 from the center hanger to the rear hanger. Dexter confirmed that 29.5 hanger spacing is for 26" springs. 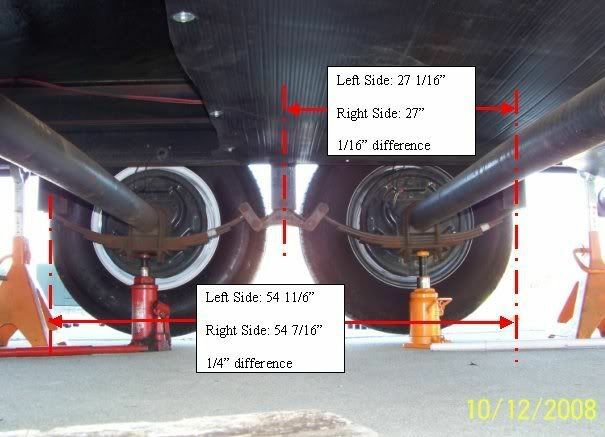 Your hangers at 59" apart center to center, with 26" springs as measured in the unloaded state and 33" axle spacing, this would leave the equalizer and shackles to take up 7" of connection length. As the springs flex, the eye to eye centers get longer from unloaded length. The shackles and the length of the equalizer centers take up the difference normally. 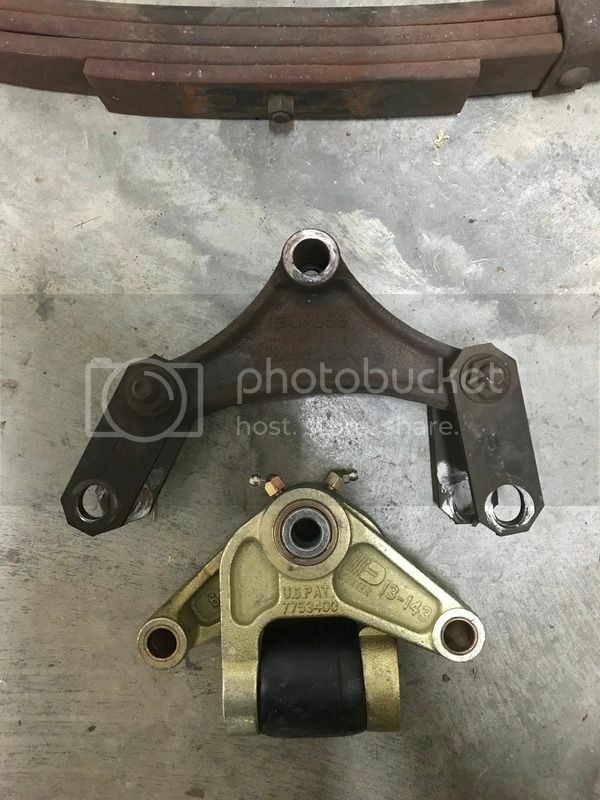 I still think what the problem is, the deflection rate of the new 6 leaf spring pack is very different then the older 4 leaf pack even though the new spring pack is rated for more total weight. The 6 leaf spring pack is getting longer much sooner and that is using up all the equalizer system compensation. In order to make that spring pack work right, the hangers need to be further apart then the 59 inches. These are my "thoughts" yet to be proved out that is what is happening. 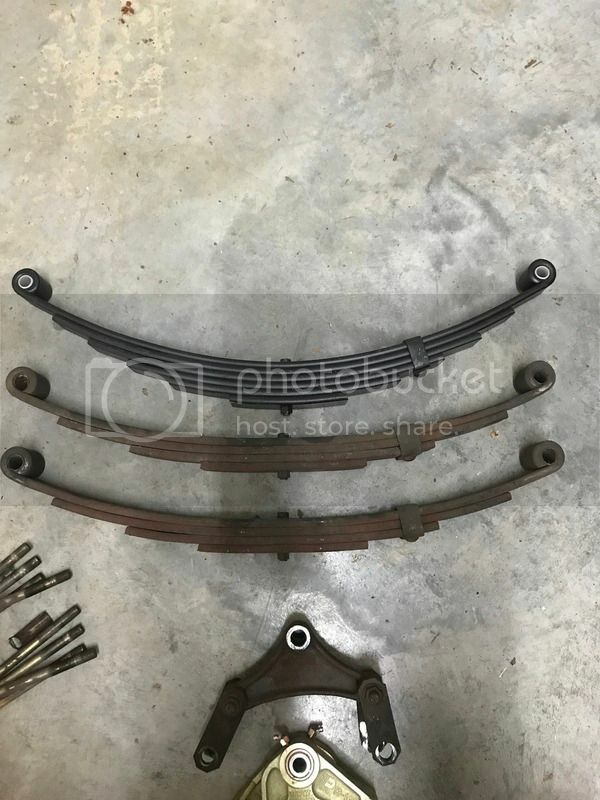 Old 4 leaf springs as they stand today. Trailer loaded. Measure eye to eye on the spring installed. Jack up camper and unload spring. Measure eye to eye on the spring installed. Now subtract the 2 numbers and the increase in spring length is what that spring deflection rate is for the 4 leaf 5,000 to 5,200# springs with your loaded camper. New 6 leaf springs as they stand today. Using a new spring not yet installed, confirm the 26" is what that spring is. Now subtract the 2 numbers and the increase in spring length is what that spring deflection rate is for the 6 leaf 6,000# springs with your loaded camper. If they are much different with the new springs being longer, the new spring rate is not going to work. While they may be softer for the initial load, you cannot deal with the length change. This is not about the overall length of the spring but the rate the spring changes under the same load of the camper. Making the same 6 leaf spring pack shorter eye to eye is not a total fix either as it too will flatten out just the equalizer may be able to take up some of the difference. But you will not know how much unless you test it. My thoughts at this point short of you confirming the spring rate is, you still want 26" springs but you need to get the spring pack deflection rate to be the same as the original or less, but not more. 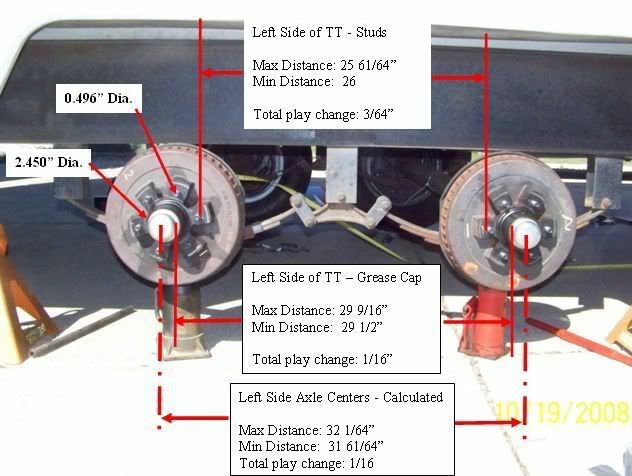 By putting 6,000# springs in with 4 leafs, odds exist the trailer will ride rougher. They are just stiffer for the loads you have. Odds are good they will not change eye centers like the 6 leaf pack does as the springs are thicker and that less flexing will fix the equalizer issue. Do you know if your spring packs are 5,000 or 5,200# rated that you have now? If they are only 5,000# then up'ing to 5,200 gives you a little cushion but not so much to add to the rough ride concern. If they are at, 5,200#, then 10 years may be all they are good for if your actual full loads are scaled at 10,400# of axle loads. 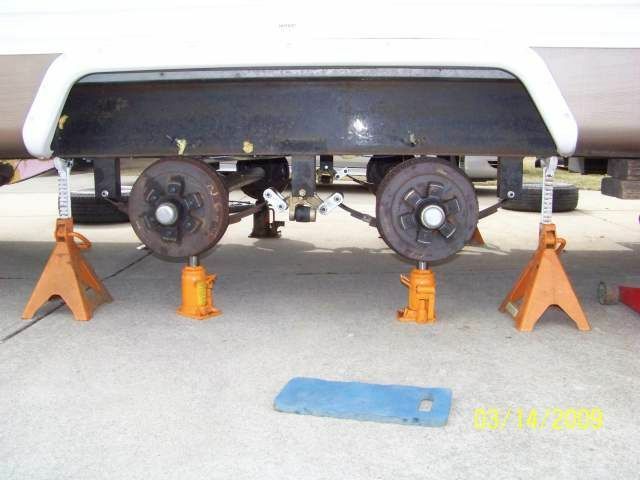 Suggest you weigh the camper axles so you know the actual weights. 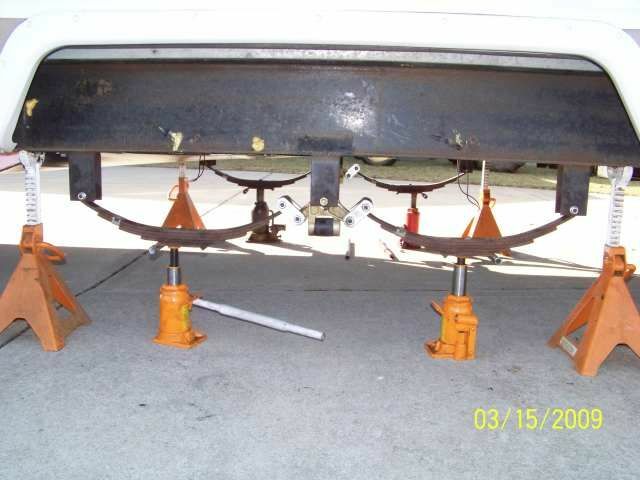 My camper is setup at a 10,000# GVWR with 2, 5,200# axles and 5,000# of springs. My scaled axle weights with weight distribution engaged are 8,300# axles with 1,640# on the TT tongue for a 9,940# GVW. I have 1,700# of excess spring capacity. The camper is 13.5 years old and the springs are not yet flat. Maybe they are better quality springs or the excess capacity is helping me, do not know which. You talked about camper height, by just going from the Alko longer rigid equalizer (6.25 centers) to the EZ flex (5.7 centers) you will loose ride height. We did not talk about shackle length as it too affects ride height. What is the old shackle centers and what is the new Dexter shackles? I have found that just using a rubber equalizer, I loose some ride height due to the rubber compressing. It is not a lot but it is some. In my case I only had 2.5" bump height above the tires to the fenders on a rigid equalizer as setup from the factory. Dexter recommends 3" bump clearance. I lost 1/4" from the rubber equalizer after driving for 2 weeks. This put me too close for comfort on a hard bad pothole bump. Since I wanted to stay with the heavy duty shackles, I lowered the center hanger to lift the camper back what I lost plus a little. At the time, Dexter was the only one I could find making heavy duty shackles. But now, Mor-Ryde makes then that are longer so there are some options at least. Point: Odds are high you will loose some ride height from just the rubber equalizer. Since the new equalizer is narrower and the vertical distance of pivot pin to shackle centers is less, you will loose some ride height. Since the vertical distance is different between the Alko and the Dexter, the shackles need to be sorted out to not have the length of them not lower the camper any more. 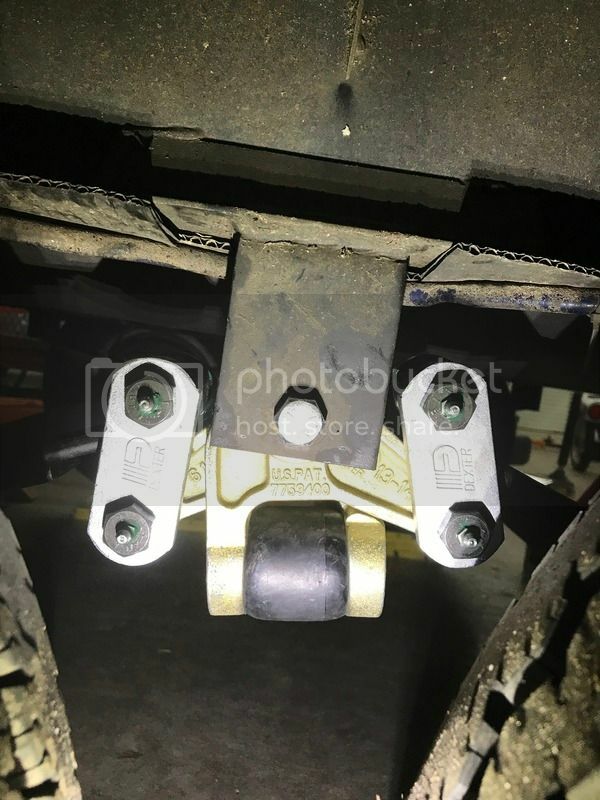 You can compensate for lost ride height by sometimes changing the the length of the shackle or by making the center hanger longer which lifts the camper. This requires some math to sort it out but it is doable to prefigure. I created a bolt on length of the center hanger. Have pics if needed. NOTE: 4-18-17 7:49PM Edited the last Summary (Point) paragraph to better reflect the issues with the shackles and the difference in vertical distance between the Alko and the Dexter. I had my TT done last year by an RV shop, it made a noticeable difference in towing. Cost was $975 parts and labor and was well worth it. The lube holes in those bolts should be placed in the 9 o'clock or the 3 o'clock position. 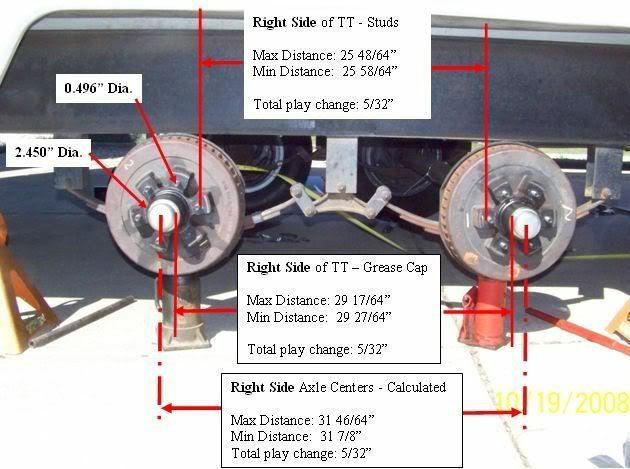 If they are placed at 6 or 12 o'clock the weight of the TT will force the bearing against the bolt and hinder or cover the exit hole and make greasing the bolt/bearing near impossible.